Snow-capped Kilimanjaro is Africa's highest mountain and the world's tallest free-standing mountain at 19,341 ft (5895 meters) above sea level. 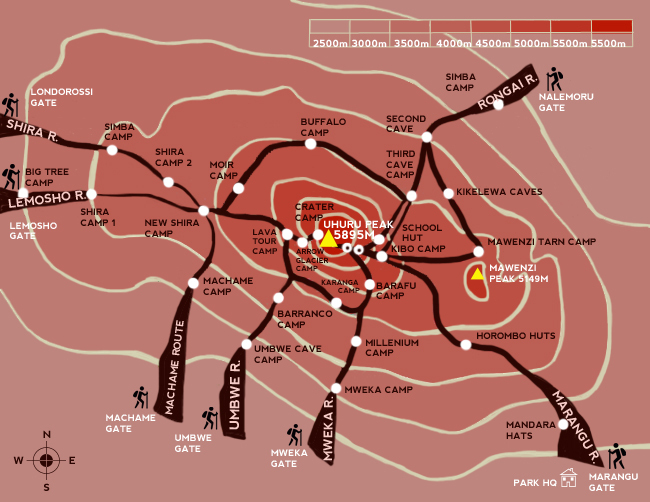 It has three major volcanic centres: Shira (4160 m), Snow capped Kibo (5895 m) and Mawenzi. Widely considered the roof of Africa, climbing mount Kilimanjaro through one of the great trekking routes is one of the most rewarding experiences that any person can enjoy. We organize treks to the summit of the Mountain using 5 different routes: Machame, Shira, Rongai, Lemosho and Northern Circuit. Regardless of the route, no special equipment (just walking gear) or previous experience is required to climb the Kilimanjaro. A good level of fitness but specially an exceptional level of determination (the last 500 meters of ascent to the summit will be extremely demanding, regardless of your physical condition) is all you will need. Travel dates: Any time of the year. Your travel dates are fully customizable, as per your preference. We consider the Lemosho 8-day Route to be the most interesting. This route provides a very balanced trek, having some of the most spectacular scenery and wildlife while not being as demanding as the Umbwe route. It also enjoys a very high summit success rate and very little traffic. If you choose to climb Kilimanjaro on this route, you will have the chance to cross the entirety of the plain from west to east in a pleasant, relatively flat hike. The Lemosho route is also the longest and less economic one so, if time or budget do not make it a convenient choice, the other two routes we recommend are the Rongai and Machame ones. The Machame Route is one of the most popular routes, being the first choice of most seasoned hikers and providing impressive views and a variety of habitats. Most climbers choose the 7 days version to err on the side of caution and make sure that they are properly acclimatized before reaching the summit. However, the 6 days route is also quite safe and most people with an active lifestyle will manage it without major problems. The Rongai Route has almost no people and provides great chances of encounters with wildlife precisely due to that fact. We do not usually recommend the Marangu route because, though it is the only route where you can sleep in huts, they sometimes prove to be less comfortable than the tents we provide. Besides, it has a lower success rate (specially the 5 days version) because it does not use the "climb high, sleep low" principle. High Season = Dry Season: The two high seasons for climbing Kilimanjaro are January through March and June through October. You can’t beat these months for weather and visibility, though you’ll have to share the trail with others. But sharing is caring, right? Plus this mountain is a behemoth; no matter the season—there’s plenty to go around. January is the driest time of year for climbing. A great time of year to consider Kilimanjaro for those less experienced. Warm and clear, the crowds are moderate. Low season for Kilimanjaro, due to this period being the rainy season. Muddier trails and lower visibility. You’ll have the trails more to yourself. 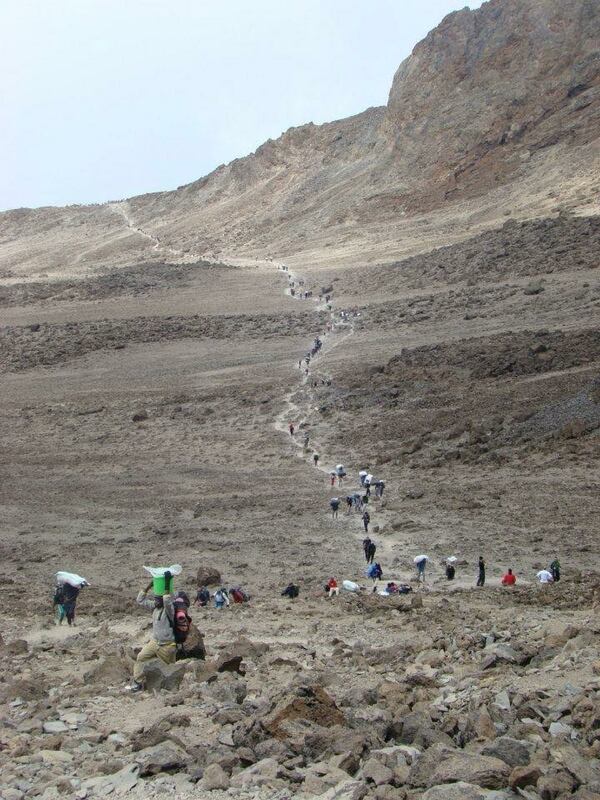 This is the most popular season for Kilimanjaro treks. Students and families are on summer break, and many choose this Nme. By June the rainy season has subsided, bringing dry days and cool nights. A short rainy season typically arrives in November. Choose these months and you’ll find fewer people. December can see more visitors due to the holidays. When considering when to climb to the Roof of Africa, each season has its advantages; you never know what you’ll get. Choose a month that best suits your schedule and goals, then hakuna matata. No worries. Because Kilimanjaro will leave you breathless (literally) and forever inspired. There’s simply no experience quite like it. So keep climbing. Please consider supporting KPAP by making a financial contribution to enable them to continue with their Partner for Responsible Travel Program and free services for porters. To make a donation, please visit kiliporters.org/donate-now.